The Denver Nuggets went a perfect 3-0 on their three-game homestand with a win over the Minnesota Timberwolves and two last-second finishes over the Dallas Mavericks and the Indiana Pacers. First time All-Star Nikola Jokic hit a game-winner against Dallas on Thursday and it was Paul Millsap who saved the day on Saturday against Indiana with his last-second shot to help Denver survive yet again. 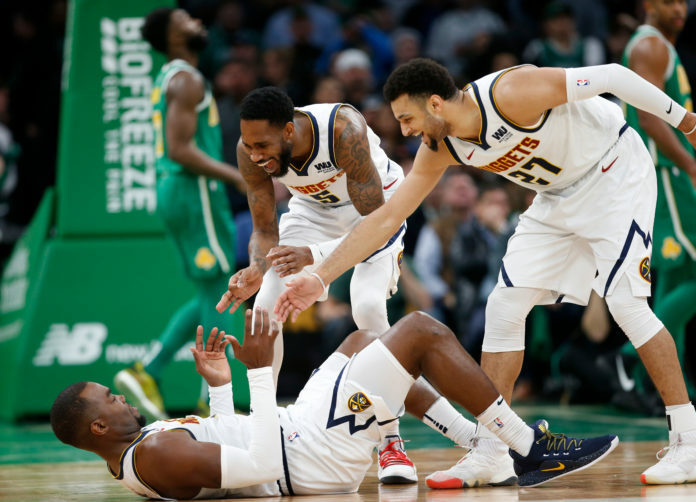 The Nuggets attempted to take that solid play on the road for their four-game road trip that began against the surging Boston Celtics on Monday for a highly-anticipated game between these two teams. There was plenty of animosity brewing from the last time they faced each other when Jamal Murray hung 48 points on the Celtics and elected to take a last-second heave when the game was out of reach to get to the 50-point mark which bothered Kyrie Irving. The game was full of ups and downs, but in the end it was the play of the Nuggets in the fourth quarter that sealed the win for Denver as they came away with a 114-105 victory to secure their first playoff berth since the 2012-13 season. With that I give you the good, the bad and the ugly. Winning the game and securing a playoff spot for the first time in six years was the biggest highlight of the night, but for Isaiah Thomas, there was a bigger moment. Thomas had a moment that not even he could have prepared himself for as the packed TD Garden arena all stood up and cheered for their once beloved and unforgotten hero. Thomas’ return to TD Garden on Monday night was the first time he returned healthy and active to Boston since he was traded to Cleveland 18 months earlier for Kyrie Irving. Thomas was a two-time All-Star and a MVP candidate for the Celtics. He gave his blood, sweat and tears to Boston and left it all out on the floor in his time with the organization. It was a rocky breakup between the two sides, but through it all, Thomas has been vocal about his love for the city and organization. Not only did Thomas get the ovation that he rightfully deserved in the first quarter, but Malone also decided to give Thomas some playing time in the win as he entered the game to a roaring Boston crowd. Thomas did not have the type of performance that he wanted — he recorded a turnover and went scoreless in only six minutes — but he did have two assists that brought some momentum to the Nuggets at a time that they desperately needed it. How Thomas will be used down the stretch and playoff run is a bit of a mystery as of right now, but for one night, things were perfect. Two of the biggest negative takeaways in the game was the way that Denver shot from beyond the arc; especially early on, and how the Nuggets turned the ball over in the third quarter. Denver got the looks that they wanted, but could not get shots to fall in the first half. All things considered it was a bit shocking that Denver went into the half with a 55-52 lead. Denver was not able to find a rhythm from deep early on going 5-18 from beyond the arc in the first half. Luckily for Denver, Torrey Craig came to play and had back-to-back game-changing plays at the end of the third quarter coupled with the fact that Denver’s defense traveled with them. The Nuggets limited Boston to only 39 percent from the field and did a good job of sustaining Irving early on. After Denver fought back to go into the half with a lead, they came out and had their worst quarter of the night offensively. In the third quarter alone the Nuggets were careless with the basketball as they committed seven turnovers in the third period alone. Denver was not executing offensively, fatigue started to kick in and there were careless passes made by the Nuggets which tied things up going into the fourth quarter at 80-80. Execution will have to be the focus down the stretch. Now that they know that they are in the playoffs, the goal is to get into a positive rhythm heading into the postseason if Denver wants to reach their full potential as a playoff contender. Four complete quarters of basketball is what it will take for the Nuggets to keep advancing and what time is better than now to get into that rhythm? The goal should be about getting better each possession. As amazing of an experience as it was for the Nuggets to end their six-year playoff drought, it is a shame that the Nuggets clinched their first playoff berth since the 2012-13 season on the road. It is the first time that Denver has made the post season in the Malone-era and it would have been fitting to win it in the Pepsi Center with the home crowd rooting them on and being part of this monumental moment. Denver has worked so hard to get to this moment and while the road has been unsteady, it has all come together. The Nuggets are having one of their best seasons in franchise history. The Nuggets are not satisfied and have aspirations of accomplishing even bigger goals set forth at the beginning of the season, but for now, they celebrate in Boston.